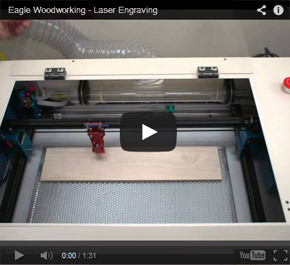 We take great pride in our work at Eagle Woodworking. 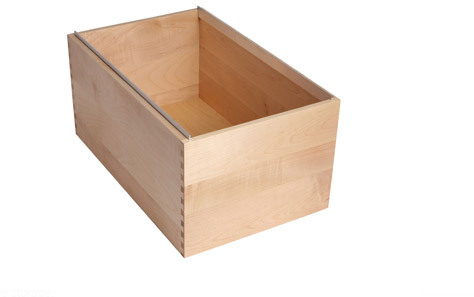 Our custom dovetail drawers are made to the exact specifications of our clients. 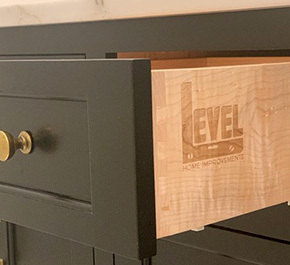 We make our custom dovetail drawers using only the finest Appalachian clear maple and other selected hardwoods, sourced from some of the nation's most highly-regarded lumber mills. This ensures that our custom made drawers are of superior quality. All the drawers we create are made with solid hardwood sides in 1/2" or 5/8" thicknesses and maple plywood bottoms in 1/4" and 3/8" thicknesses. As for finishes, we apply two coats of protective lacquer to each drawer, with a sanding in between applications. 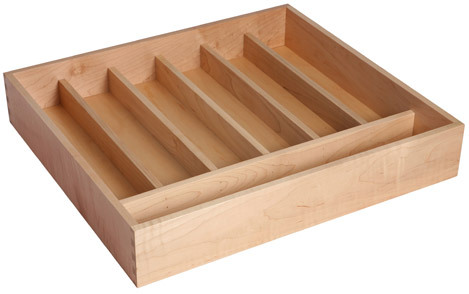 We offer many options to further enhance the custom look of your drawer. Options include scooped fronts, shaped sides, cutlery and utensils inserts, file drawers, drawers with dividers, double deck drawers, spice storage, knife storage, trash drawers, bread drawers, u-shaped drawers, corner drawers, and custom laser engraving. We sell Blum hardware as an additional service to our clients. These top-of-the-line runners ensure that whether the drawers are fully loaded or empty, closed gently or with force, they'll do so silently and effortlessly each and every time. Hardware can be shipped in advance of the order if desired. On request we can provide other types of drawer hardware. In order to provide the best service to our customers, our turnaround time is just one week. Along with our shipping partners, FedEx and common carrier, we strive to ensure on-time delivery, with your drawers reaching you in good condition. The Eagle Woodworking Team is very focused on not only delivering your drawers to you when promised, but safely and in great condition. We build our own shipping pallets, and we make them a little oversized which adds some extra protection when shipping. The pallets are light and easy to dispose of, and ensure your order arrives safely. Store cutlery neatly for easy access. Typical layout has one divider going side to side located at the front of the drawer. The other dividers run front to back. Approximate spacing between dividers is 3" - 4". Typically installed in a 4" high drawer. Inserts can be removable or fixed. The spacing of the dividers accomodate most cutlery 3" to 4", typical spacing. Hard-to-locate cooking utensils become instantly accessible with our custom dividers. Dividers are spaced to accomodate most utensils. Spacing is 3.5" - 4.5". Dividers run the full depth of the drawer. Store utensils and cutlery neatly for easy access with our flexible combination inserts. 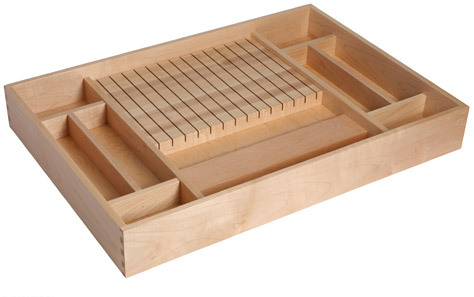 This insert allows for the storage of cutlery and utensils. Some dividers extend from the back to the front to provide utensil storage. 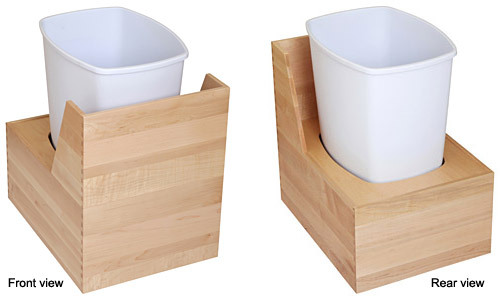 Allows for the storage of utensil and cutlery in one insert. Free up counter space with our knife block insert. Width of knife block is 16" or less. Spacing between knives is typically 1". Largest dimension is 16" wide. Knife block can be custom fit to any size under 16" wide. Eliminate the age-old problem of accessing and locating spices with our innovative, angled spice jar inserts. Spice drawer boxes are left loose in the drawer. A typical 21" deep drawer will have 4 rows of spices. Each row is configured so that the spice jars are tilted. Features 4 rows for a typical 21" deep drawer. Rows are installed loose for easy removal and cleaning. Rows are configured to tilt spice jars at an angle for easy and immediate visual location. 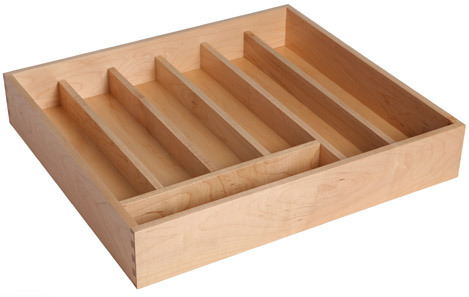 Organize and neaten drawer contents with our customized drawer inserts. 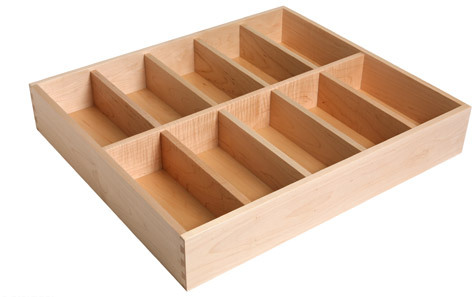 Because our drawers are custom made, we can install dividers to your specifications and layout. Dividers can be built and installed to your layout and specifications. Dividers can be either fixed or removable. Removable dividers are housed in DADOs. Instantly increase storage space with our double drawer configuration. Top drawer is installed so that it slides out of the way when the bottom drawer needs to be accessed. 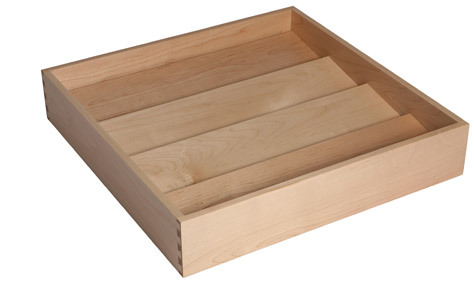 The top drawer is configured to approximately one-half the height of the bottom drawer. The top drawer has sidemount slides. The bottom drawer can have undermount slides or sidemount slides. The top drawer extends fully to allow access to the bottom drawer. File Drawer boxes can be configured for either letter-width files or legal-width files. Bar sticks up 3/8" above drawer. File bars can run front to back, or side to side (lateral). 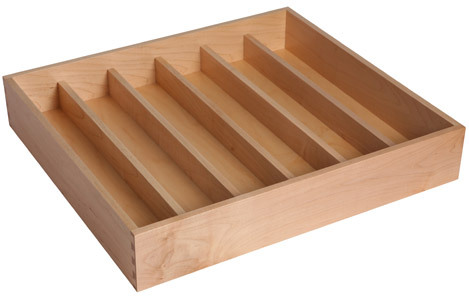 Minimum width for letter-sized drawer is 13-3/8" O.D. 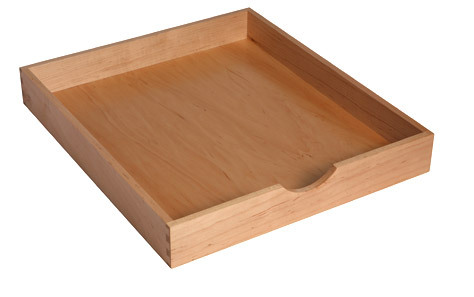 Minimum width for legal-sized drawer is 16-3/8" O.D. We can add scoops to the front of the drawer. We can add scoops to the front of your dovetail drawer. Scoops are typically for pullout drawers. Our standard scoop is a radius 4" wide by 1" deep. Adding a scoop on the front of the drawer is optional. Scoops are typically for pullout drawers. 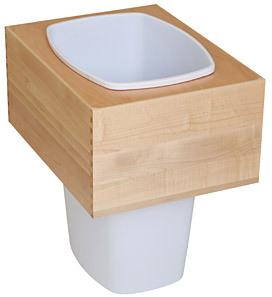 Our standard scoop is a radius 4" wide by 1" deep. 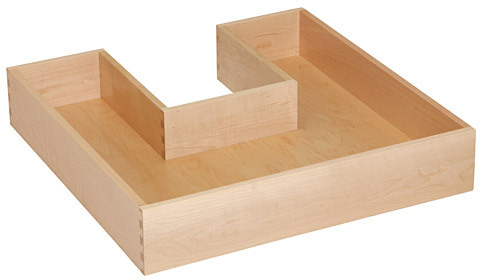 We can shape the sides of your dovetail drawer to your specifications. For custom shaping, please provide a sketch or drawing. On the order form indicate the height for the front and back of the drawer. We typically finish the front of drawers with shaped sides. Adding a scoop on the front of the drawer is optional. Add your logo or text to our dovetail drawers with our custom laser engraving. Custom logo engraving adds a distinctive and professional appearance to your dovetail drawers. 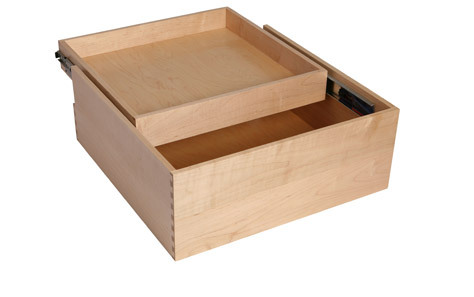 Have your logo or custom text engraved on your dovetail drawer. We can size and place your logo or text to your specifications. Please email a logo graphic file for this option. Under-utilized areas due to plumbing pipes can now be a functional space. Can be customized to just about any configuration. Gain easy access to those deep corner cabinet areas, allowing for great space utilization. 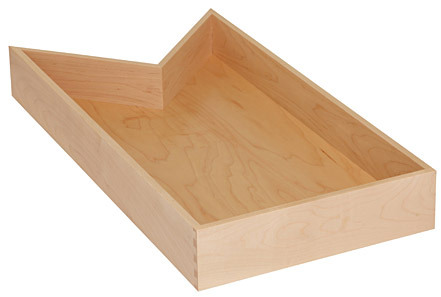 Our standard corner drawer is designed to work with a 27-inch Blum undermount slide. The overall length of the drawer, using the 27-inch slide, is 31 1/8"
Designed so that large drawer fronts or doors can be attached securely. 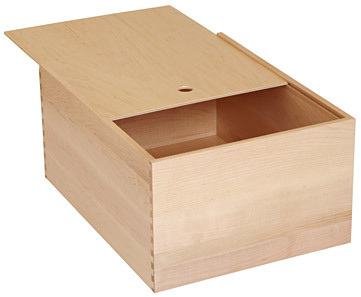 Lid is removable so that the drawer front or door can be attached easily. Opening can be any size, just specify in your order. This drawer configuration is designed for easy cleanup. Opening can be built for either undermount or sidemount slides. 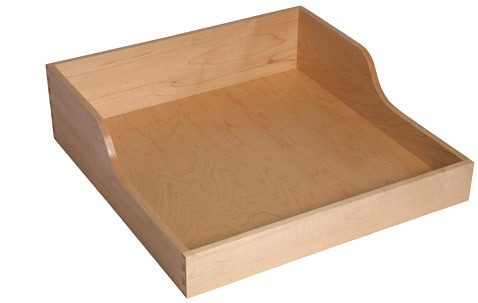 Designed to store bread and other pantry products.